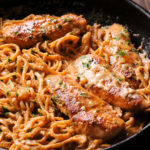 Creamy Lemon Garlic Chicken Pasta - What's In The Pan? 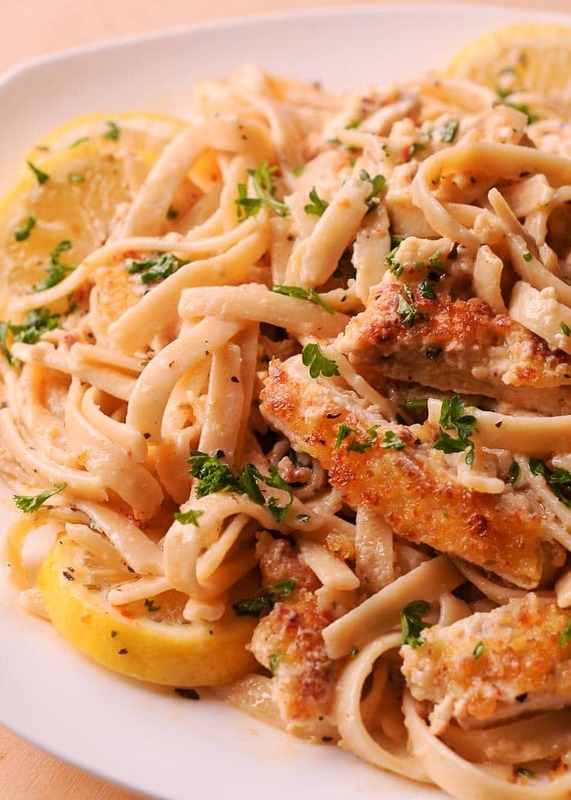 Creamy Lemon Garlic Chicken Pasta is an easy to make weeknight dinner! 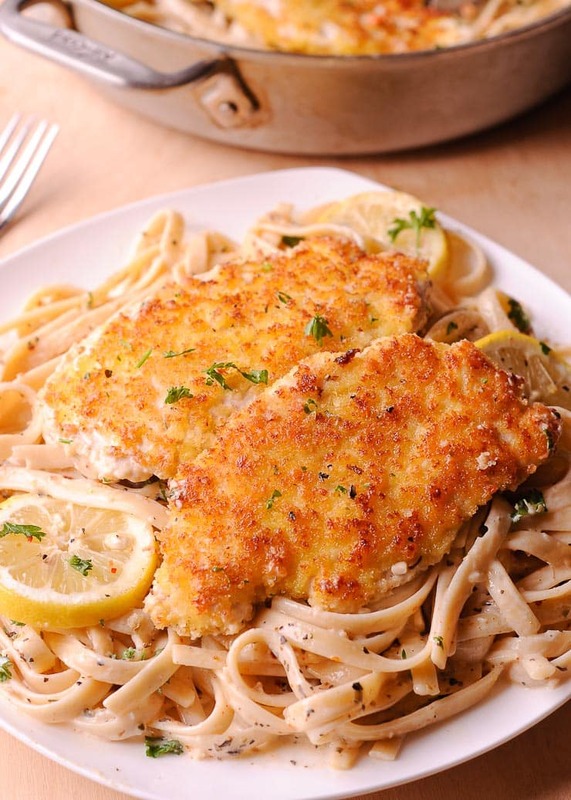 Parmesan crusted chicken on top of amazing lemon garlic pasta! Comforting, easy and delicious, it comes together fast in only 30 minutes! This creamy lemon garlic chicken pasta is a simple but flavorful homemade dinner that can be on the table in under 30 minutes. 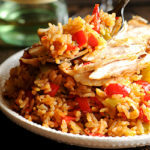 Incredibly easy to make, it makes perfect sense for quick weeknight dinners! or date nights. The chicken is tender, and the sauce is so delicious and comforting! Perfect restaurant quality meal that is super easy to make at home. My favorite part about this creamy chicken pasta dish is that it’s super easy to make. I divided the process into 4 easy parts. First things first, prepare the cheese, bread crumbs and egg for your chicken in 3 separate bowls. Coat the chicken cutlets in cheese and Panko bread crumbs and pan sear them until golden. Meanwhile boil your pasta according to package instructions, drain, and set aside. I like to cook my pasta in salty water in order to give it better flavor. Next, make your sauce, adding heavy cream and wine to the same pan where you seared your chicken. Lastly all you have to do now is to add pasta to the sauce, and then serve the chicken over your cooked pasta. 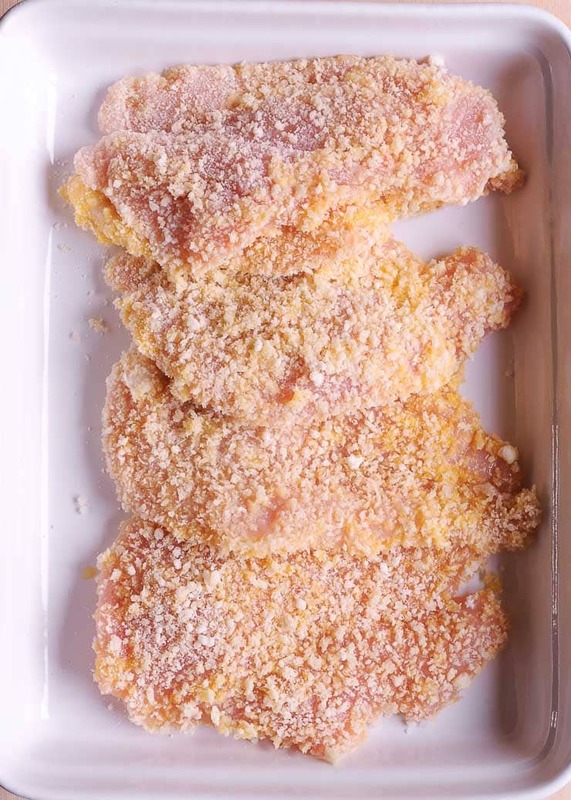 Coat the chicken cutlets with the Parmesan and Panko breadcrumbs before pan searing them. Prepare the creamy lemon garlic sauce, add you cooked pasta and season generously. Should I slice my chicken? I prefer to cut my chicken into bite-sized pieces before serving. Basically, I cook the chicken breasts whole, keep them removed from the pan after cooking, slice them up, and then mix all of the chicken together with pasta sauce. 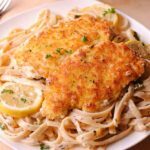 Can I make Lemon Garlic Chicken Pasta in Advance? If you don’t have time to make this dish fresh, you can make it in advance to serve later. I recommend that you prepare everything ahead, but keep in mind that the pasta will absorb a lot of the sauce, so your dish will be less creamy. In that case, add extra chicken broth when reheating the pasta. 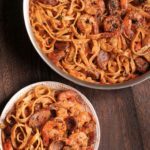 You can also prepare everything except for the pasta, and then to cook the pasta fresh when you are ready to serve and add it to your other ingredients after reheating them. 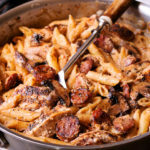 More chicken pasta dishes to try! 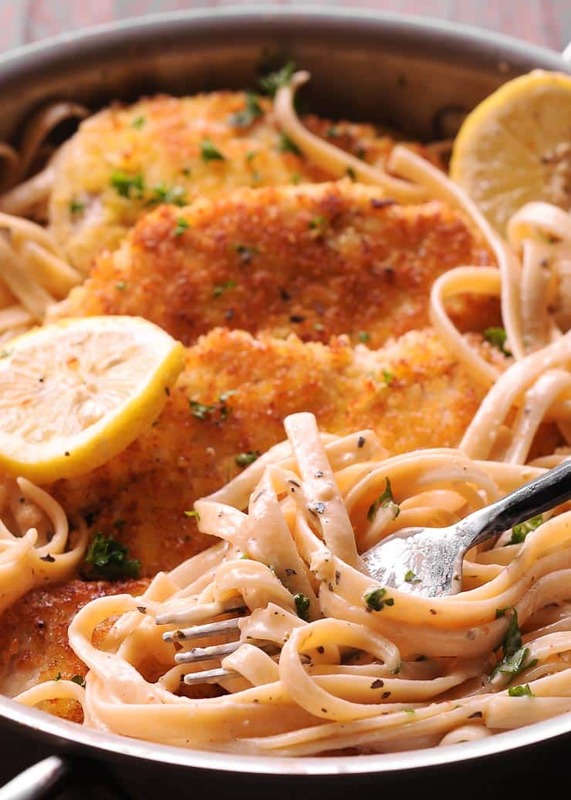 Made with thin chicken breasts, pasta, Parmesan cheese and white wine, this Lemon Garlic Chicken Pasta recipe is one of our family’s favorite meals. 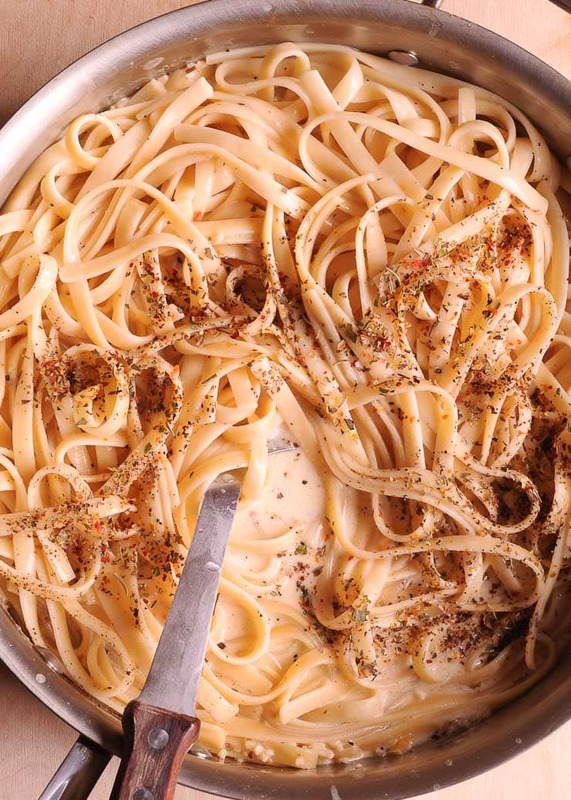 Amazingly delicious creamy sauce with white wine and Parmesan cheese! Prepare 3 bowls for each of the following: Parmesan cheese, egg and bread crumbs. Dip each chicken breast in the Parmesan, then in the egg, and then coat in the bread crumb mixture. Preheat large skillet over medium heat. Add olive oil. Once oil is bubbling, place coated chickens onto the skillet. Cook for about 3-4 minutes on each side until the outside is crispy and the chicken is cooked through. Remove onto a plate. Slice them into bite size pieces or keep them whole. Meanwhile cook the pasta according to package directions and drain. Add butter to the skillet. Once it melts, add garlic and cook for 1-2 minutes. Now add lemon, wine and heavy cream. Add cooked pasta into the sauce. Season generously with salt, pepper and Italian seasoning, to your liking. Stir well into the sauce and reheat. Add sliced chicken breasts into the pan to reheat. Serve hot, with chopped parsley and additional Parmesan. This was amazing! I added 1/2 lb. ground italian sausage to chicken.